This week, the long-rumored "Proctor Lake hypsilophodont" was published as Convolosaurus marri (Andrzejewski et al. 2019). I could hardly turn down profiling a "hypsilophodont" of such long-standing mystery, so let's get started. 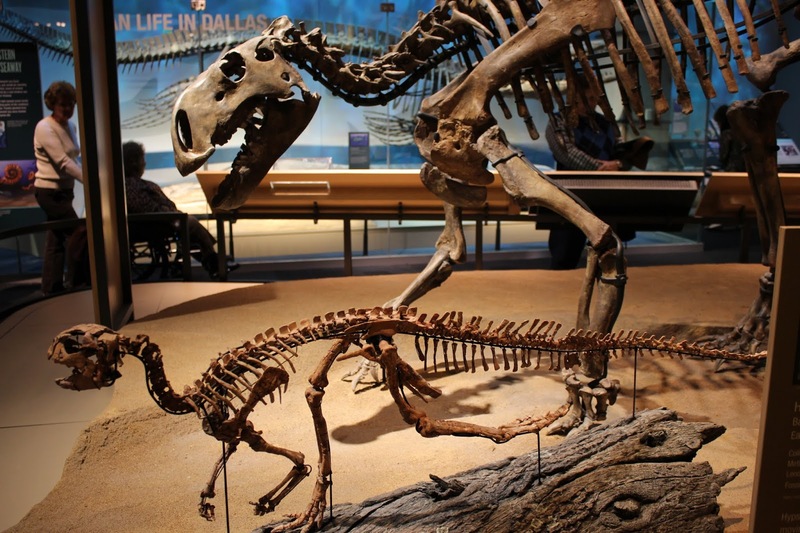 Genus and species: Convolosaurus marri; "Convolo" comes from the Latin "convolare", "to flock", in reference to "clusters of juvenile specimens"; "marri" honors Dr. Ray H. Marr, who has produced videos for the Society of Vertebrate Paleontology and promotes undergraduate research at Southern Methodist University (SMU; Dallas, Texas). Together, we get "Dr. Marr's flocking lizard". Citation: Andrzejewski, K. A., D. A. Winkler, and L. L. Jacobs. 2019. A new basal ornithopod (Dinosauria: Ornithischia) from the Early Cretaceous of Texas. PLosONE 14(3):e0207935. doi:10.1371/journal.pone.0207935. 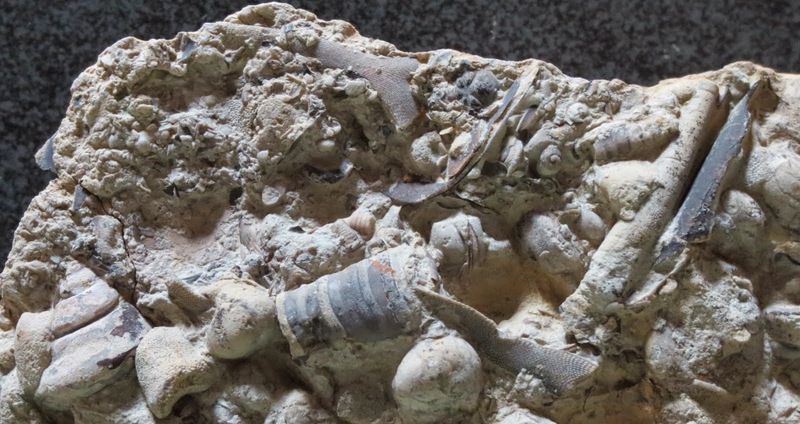 Stratigraphy and geography: The fossils come from low in the Lower Cretaceous Twin Mountains Formation (Aptian age) of Proctor Lake, Comanche County, Texas (Andrzejewski et al. 2019). Holotype: SMU 72834, most of a skull and skeleton including (deep breath): the skull, 9 cervical vertebrae, 15 dorsals, 6 sacrals, 23 caudals, complete right and partial left shoulder girdles, most of the left arm (hand only partial) and partial right humerus, articulated and mostly complete pelvic girdles (minus the posterior shafts of the ischia and pubic bones), and partial left and right legs (Andrzejewski et al. 2019). An additional 38 SMU catalog numbers are referred to the species, with the end result that basically the entire skeleton is represented over a growth series. 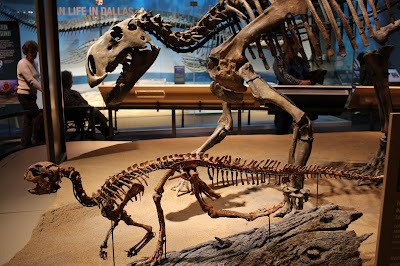 Convolosaurus (foreground) and approximate contemporary (and distant relative) Tenontosaurus (background), at the Perot Museum of Natural History. Found at Wikimedia Commons. Proctor Lake with the two quarry sites marked, plus index map of Texas (lower left) with Comanche County in green, and index map of the United States (right), with Texas shaded. Figure 1 in Andrzejewski et al. (2019). CC-BY-4.0. As mentioned, the Proctor Lake sites are low in the Twin Mountains Formation, which had a metaphorical front-row seat to the rise of the Western Interior Seaway. Granted, marine transgressions are more "a slightly higher shoreline each year" than "giant waves of water arriving", but it's still a claim to fame. This formation is followed by the somewhat more famous Glen Rose and Paluxy formations. Winkler and Murry (1989) interpreted the Proctor Lake sites as a semi-arid floodplain in a valley. The section includes a mix of sandstone, siltstone, and mudstone beds, with the dinosaur bones limited to two intervals between 15 and 18 m (49 and 59 ft) above the base of the formation. The lower is a silty red mudstone, and the upper is a bioturbated (disturbed so heavily by organisms that sedimentary structures are lost) siltstone to fine sandstone unit with dinosaur fossils at the base (Winkler and Murry 1989). The bone deposits are in paleosols ("fossil soils") with no evidence of significant fluvial action (Andrzejewski et al. 2019). Only three vertebrate taxa have been reported from the Proctor Lake sites: the croc relative Wannchampsus kirpachi, a dromaeosaur represented only by a tooth, and Convolosaurus marri, represented by at least 29 individuals (Andrzejewski et al. 2019). The skull of C. marri looks rather like a cross between traditional restorations of Hypsilophodon and Dryosaurus. The profile of the skull is fairly short, and the snout is not extended like in Thescelosaurus. However, a short face in an ornithopod is generally a sign of youth, and there was some growing yet to do for even the largest known C. marri individual, so an adult might have had a somewhat longer face. There are no obvious crests, bumps, ridges, or other features for bony display or defense. The premaxillary teeth are not as peg-like or pointed as in Thescelosaurus, but are taller and skinnier than the cheek teeth. Aside from the four teeth per premaxilla, there are up to ten teeth per maxilla and eleven teeth per dentary (Andrzejewski et al. 2019). It's Dryolophodon! Or Hypsilosaurus! Or... well, at any rate, it's Figure 4 in Andrzejewski et al. (2019). CC-BY-4.0. As with the skull, the postcranial skeleton is built along general "hypsil" lines of small body, long legs, and short arms. The neural spines of the caudals are a bit on the elongate side, but not enough to produce a fin or sail. (Tenontosaurus, present higher in the formation, does have a notably deep tail, if you want to see what that looks like.) The hand has five fingers, but V (our little finger) is basically a nub jutting out of the wrist. The first three fingers have pointed unguals. One articulated hand has three bones in the middle finger (more derived), but another has four (more basal). The foot has four fully developed toes and a splint of a metatarsal representing V (our little toe). Interestingly, although young dinosaurs are usually regarded as faster than adults, and a longer tibia than femur is usually regarded as an adaptation for speed, in C. marri the tibia and femur are about equal in length in a smaller individual, but the tibia is 15–20% longer than the femur in larger individuals. To give you an idea of scale, SMU 72834, the largest known individual, has a femur estimated at 316 mm long (12.4 in) and a tibia estimated at 362 mm (14.3 in). The overall length of this individual is estimated at 2.5–3 m long (8.2–10 ft), but it was not fully grown (Andrzejewski et al. 2019). Dinosaur hands tend to get neglected, so here's the left hand of SMU 70456 (Figure 20 in Andrzejewski et al. 2019). Digits are numbered inward-out, so I is the thumb of our hand, II is the "ring finger", and so on. For orientation, "U" is the ulna, "R" is the radius, the wrist bones are obscured, and "Mc" are the metacarpals, which make up the palm part of your hand. Finger II may look like it has four bones, but there are only three (the first phalanx bone after the metacarpal is broken). CC-BY-4.0. The Proctor Lake dinosaurs were mostly much smaller than SMU 72834, with femur lengths generally half or a third as long, down to 51 mm (2 in) (Andrzejewski et al. 2019). Because of the preponderance of young C. marri, it has long been the suspicion that the accumulation of bones is related to nesting, going back to Winkler and Murry (1989). There are four clusters of multiple articulated individuals, and no evidence of predation. Andrzejewski et al. (2019) interpreted the clusters as evidence that the animals formed groups after hatching, perhaps as protection from predators. Lines of arrested growth could not be found in one of the largest femora (Winkler 1994), but the authors doubted that the animal was really less than a year old; they suggested that instead C. marri underwent rapid continuous growth until reaching subadult size. Andrzejewski, K. A., D. A. Winkler, and L. L. Jacobs. 2019. A new basal ornithopod (Dinosauria: Ornithischia) from the Early Cretaceous of Texas. PLosONE 14(3):e0207935. doi:10.1371/journal.pone.0207935. Norman, D. B., H.-D. Sues, L. M. Witmer, and R. A. Coria. 2004. Basal Ornithopoda. Pages 393–412 in D. B. Weishampel, P. Dodson, and H. Osmólska, editors. The Dinosauria (2nd ed.). University of California Press, Berkeley, California. Winkler, D. A. 1994. Aspects of growth in the Early Cretaceous Proctor Lake ornithopod. Journal of Vertebrate Paleontology 14(supplement to 3):53A. Winkler, D. A., and P. A. Murry. 1989. Paleoecology and hypsilophodontid behavior at the Proctor Lake dinosaur locality (Early Cretaceous), Texas. Pages 55–61 in J. O. Farlow, editor. Paleobiology of the dinosaurs. Geological Society of America, Boulder, Colorado. Special Paper 238. Winkler, D. A., P. A. Murry, L. L. Jacobs, W. R. Downs, J. R. Branch, and P. Trudel. 1988. The Proctor Lake dinosaur locality. Hunteria 2(5):1–8.